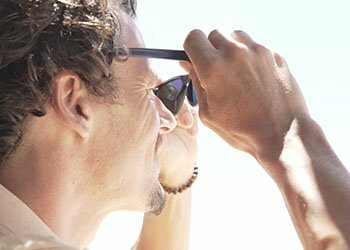 At Sunglass Fix, we know how much our customers love their sunnies! And we want them to keep them in top condition for years. 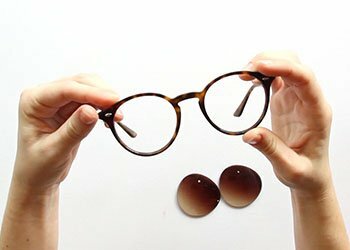 We have created a number of videos explaining how you can DIY sunglass repair - things like adjusting your frames, replacing your lenses, and from how to adjust your frames, replace your lenses, and keep the screws protected and working well. If there's any specific topic you would like us to share please contact us at info@thesunglassfix.com.au and we'll see what we can do about adding it to our list. 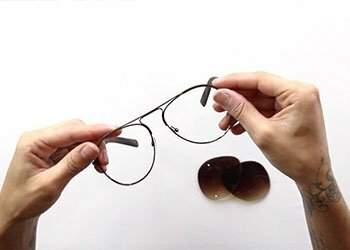 Hinges should be tight enough that a gentle shake of the sunglasses while holding the lenses does not cause the arms to move. They should also be loose enough that they don't break or strain when opening and closing. Over time sunglass hinges wear and the screws work themselves out. 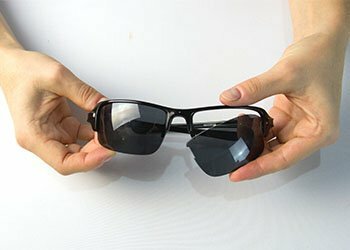 Loose hinges generally imply a looser fit and higher probability the sunglasses will fall off your head or slip when you are wearing them. To tighten your sunglasses, determine if you have phillips or standard screws. It's important to get proper screwdrivers and having a few quality screwdrivers around the house will pay for themselves over time. I would spend the $10-$15 over buying the cheap ones. They don't work well and frequently strip screws. Generally a firm grip of the sunglasses and a slight turn, about 5 degrees, is all it takes. After each turn do the shake test again until the arms don't move but they close smoothly. Once both arms are adjusted I would suggest a coating on the screw head and screw bottom (if exposed) with clear nail polish. Both Metal and Plastic Frames can be adjusted. You should have a good idea of the adjustment you want before proceeding. If your sunglasses are too large try tightening the hinges first. Tighter hinges on eyeglasses sit firmer on your face. 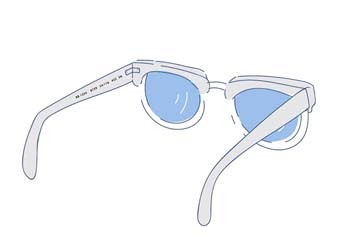 If tightening your hinges isn’t enough The Sunglass Fix suggests slightly bending in the arms or the nose area. Both arm and nose adjustments will bring the end of the arms closer together thus fitting tighter on your head. First, trace your frames on a piece of paper. It’s important to know your starting shape. Frame adjustments should move in small increments. Usually only minor adjustments are required. Moving the arms in about 1cm at a time is the most we would ever suggest in a single adjustment. 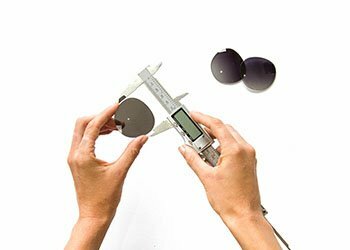 After each adjustment you can place your frames back on the traced pattern to see how much you have adjusted the sunglasses. To adjust plastic frames we suggest soaking the frames in very hot tap water (60 Degrees Celsius) for 30 seconds. Never use boiling water as it may melt some frames. If bending the arms perform the bend about twice as far as you desire to the warm frame and hold it for 10 to 20 seconds. Release the hold and put your frames back on your original traced pattern to see how much the end of the arms have come in. Once the frames are cool to touch you can try them on to see how they are fitting. Repeat this heating and bending process until desired adjustments are made. Please Go slow. Better to adjust multiple times than to break or harm the frames. In most cases metal frames can simply be bent by hand. We recommend tracing the frame first and making small adjustments until you get the desired fit. Additionally, needle nose or any standard set of pliers can also be used to help with bends in firmer frames. We recommend covering the teeth or clamps of any pliers with a cloth. They will scratch frames if you do not cover pliers or frames first. Screw In Nose Pads: These nose pads have a notch on them that goes into a metal stem that has a screw that goes through nose pad stem and the nose pad to hold secure it. Push In Nose Pads: Push In nose pads have a notch on the nose pad that is tapered. Once pushed through the nose pad stem loop it snaps in and remains secure. Rubber Moulded Nose Pads: These are perhaps the most diverse range of nose pads. They are a rubber moulded compound attached directly to the frame. Screw In Nose pads are installed by unscrewing the small, usually 1mm, screw in the nose stem just enough to release the old nose pad. Please don't completely remove the screw as they are hard to find if you drop them. Insert the new nose pad in the same direction as the original pushing the nose pad tab through the stem receiver. Line up the hold in the nose pad receiver the best you can then re-tighten the screw. Push In Nose pads are installed by first removing the original nose pad. Most of the time this can be done by pulling on the nose pad while firmly holding the nose pad stem. It's important to get a firm grip on the stem as stems will bend or break off if too much pressure is applied to them. You can also use a toothpick or optical screw driver to push the nose pad tab through the them receiver. Once removed insert the new nose pad into the receiver. Push firmly on the nose pad face while holding the back of the stem receiver. If it doesn't go all the way in then get a set of pliers and cover the pliers teeth with a cloth. Very gently squeeze the nose pad into the stem putting as little strain on the stem as possible. Rubber Moulded Nose Pads are very similar to Push in Nose Pads. There are many flavors of rubber moulded nose pads but most have a receiver on the frame that the rubber clips into. You can firmly pull off the existing nose pad and push on the new nose pad on the same receivers. The biggest issues we find with rubber moulded nose pads is that there are so many designs on the market that are frame specific it's difficult to get replacements. 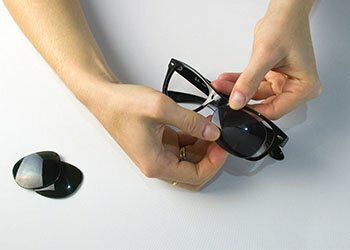 You have two choices: First choice is to contact the manufacturer of the sunglasses directly and provide your model number and see if they have replacement nose pads. If it's a current model you might be able source nose pads from them. Alternatively, The Sunglass Fix has found a new product on the market called Sugru. We have been using it for about 4 years and it is a great alternative if you can't find replacement from the manufacturer. This product is similar to Play Dough. It's easily moulded to a shape. You can mould it to your frames and put on your sunglasses to get a perfect mould to your nose. Once you are happy with the nose pads you let it sit for 24hrs and it secures itself to the frame and becomes a firm, long lasting, non smearing rubber nose pad. Many optometrist carry nose pads. Your original sunglass manufacture may be an alternate source. 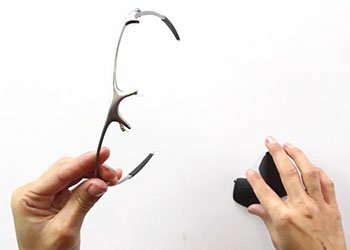 Additionally, The Sunglass Fix carries a massive range of nose pads and other repair accessories on it's site. If you’re having any problems finding what you’re looking for please go to our FAQ page or contact us directly. We are happy to help!